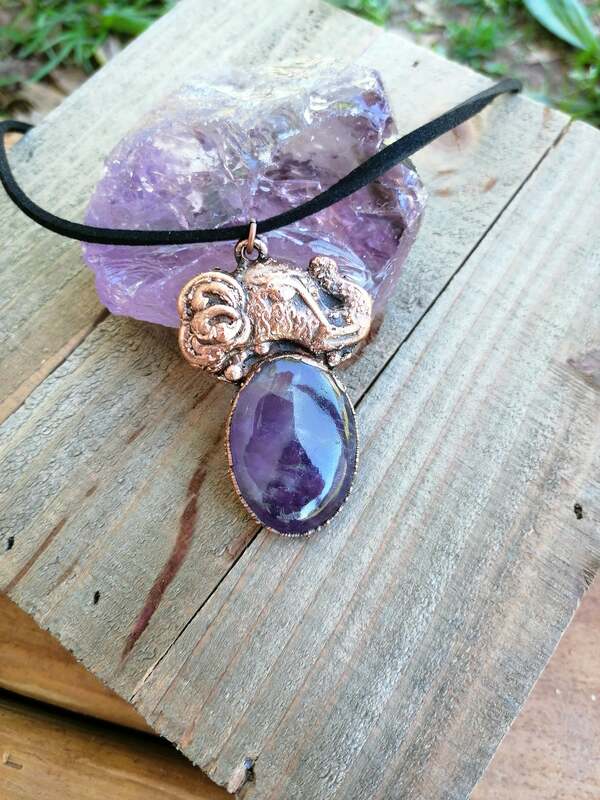 This listing features an Amethyst Cabochon with an Electroformed Elephant attached to it by copper electroforming. the pendant measures 51x32x7mm and it hangs on a 24' Suede black cord. Elephant symbolism also represents sensitivity, wisdom, stability, loyalty, intelligence, peace, reliability and determination, which are all seen in the animal's nature when observed in the wild. In many cultures, elephants are revered and highly respected due to their symbolic meaning. The amethyst gemstone imparts healing energies and an improved life balance. When placed on a crystal medicine wheel, purple amethyst stones encourage healing and promote balance in your life. A purple amethyst stone in this position provides clarity, in keeping with amethyst meaning. If you would like this design with a different Gemstone Cabochon please message me.